A school which is taking part in our Young Readers Programme recently had a surprise visitor to their assembly - David Walliams! 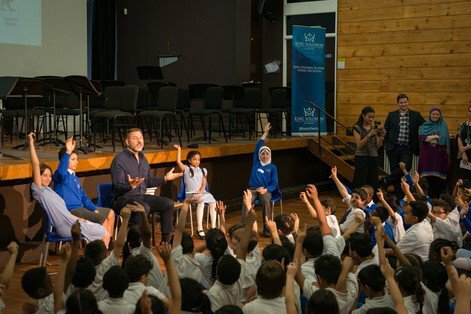 Over 200 pupils in Years 4, 5 and 6 at King Solomon Academy in Marylebone, London, got the surprise of a lifetime when author and comedian David Walliams arrived at their Friday assembly to talk to them about reading and writing. David's surprise visit was to celebrate the launch of his newest book, World's Worst Children 2. David read extracts from two of his books, Gangsta Granny and World's Worst Children to the pupils, who then got the chance to ask him their questions about his books. King Solomon Academy is taking part in our Young Readers Programme and is passionate about getting children reading for pleasure. The Young Readers Programme in their school is funded by British Land. Our Young Readers Programme motivates children and young people from disadvantaged backgrounds to read for enjoyment, teaching them how to choose books they'll enjoy and giving them books of their own to take home. Read more about the Young Readers Programme here.